The Hoop Project, alongside the River Recreation Festival, has served as one of the largest events in Gallipolis City Park. GALLIPOLIS — Memorial Day park visitors have once again come and gone, but Gallipolis City Park — and the rest of the city — still await a variety of events to punctuate the summer season. The longstanding tradition of Christian music ringing through City Park called “Gospel in the Park” can be heard most Fridays throughout the summer. The event has long been free and open to the public. Hot Summer Nights also returns to the French Art Colony with opening act HURL and FRIENDS, June 7. Following, Devin Henry will take the stage, June 14, New Jasper Station, June 21, Cee Cee Miller, June 28, Deep Creatures July 5, Paul Doefinger, July 12, Brent Patterson, July 19, Same Stephens, July 26, Ben Davis Jr., Aug. 9, Stringbenders, Aug. 16, Micah Kesselring, Aug. 23, and Paul Doefinger, Aug. 30. The events open at 6 p.m. and music beginning at 6:30 p.m. Admittance is $5 a person. River Recreation Festival returns to celebrate America’s birthday on the third and fourth of July. Pageants, music and food have long been associated with the event. 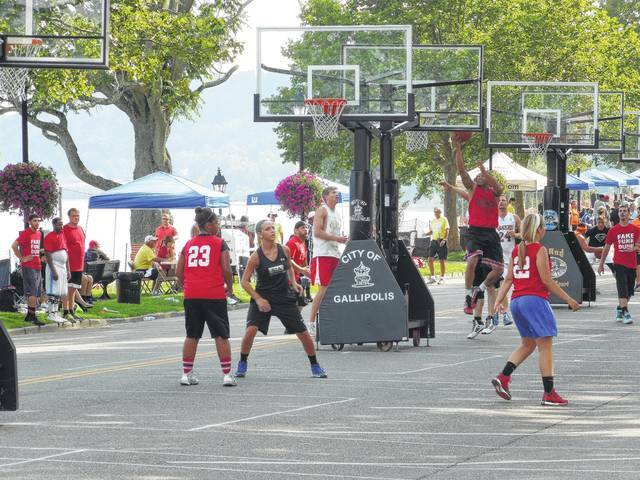 The Hoop Project returns to City Park July 21 and 22 as the premier 3-on-3 basketball tournament of the region with slots available for all ages to compete. More information can be found at thehoopproject.com. The Old Car Show returns to City Park Aug. 11 and the City Park Yard Sale makes its appearance Aug 18. For more information about the yard sale, contact the Gallipolis Municipal Building. The Harvest Moon Pow Wow and its traditional drum circles return Sept. 1-3 and the Gallia County BBQ Festival lights up Sept. 8. Vinton Baptist Church’s Rock the Block will be held Sept. 29.